The story of Australian bushranger Ned Kelly, continues to inspire artists, as each generation discovers and re-interprets the legend. Imagining Ned, showing at the Bendigo Art Gallery, is the latest metamorphosis of Ned and the Kelly Gang. As well as the historical ephemera associated with Ned Kelly, there are artworks by Arthur Boyd, Norman Lindsay, Sydney Nolan, Albert Tucker, and contemporary artists, Liam Benson, Adam Cullen, Mars Drum, Guan Wei and others. The first exhibit upon entering the dimly lit room is Ned’s armour. Displayed in a large glass case, in the centre of the room, the armour charges the space with a heightened sense of reality and subsequent tension. It stands like some ghostlike sentry or, a gatekeeper, to remind visitors that behind the legend was a living, breathing man. You can almost feel the weight of the thick, metal, mouldboard plough shares. 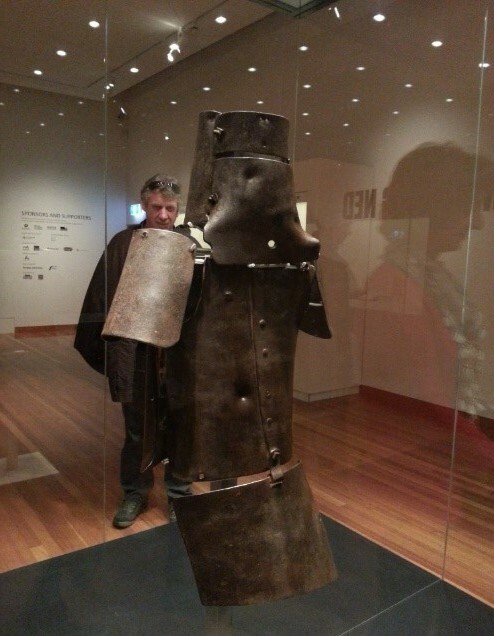 The empty space framed, by the steel shoulder and breastplates, is more evocative of Kelly than any other exhibit. The bullet marks and dents bring the reality of the final confrontation to the fore. Just past the armour are glass cases containing a rifle, the Jerilderie Letter, Ned’s death mask, a photo of him taken on the day before he was hanged, and the petition for Ned’s reprieve from execution. Walking into the contemporary exhibition space, Sydney Nolan’s works line the walls. This is the largest collection of Nolan’s Kelly series displayed together. According to curator Tansy Curtain, Nolan claimed they were biographical. Many of the works explore Kelly’s political and personal identities. 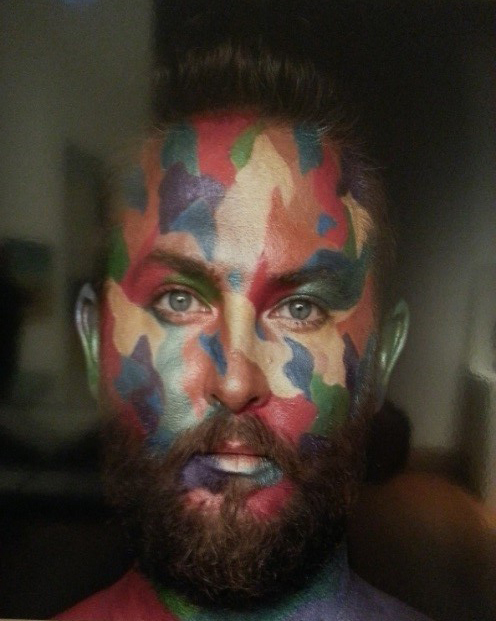 One example is Liam Benson’s photo, Ned Kelly Redgum: Hypercolour 2014, from his Noble Savage series. Benson grew a beard in the Ned Kelly style as part of his exploration of masculinity and the loaded associations of the beard in contemporary society. Benson’s resemblance to Ned is uncanny. Benson’s brightly coloured, camouflage-patterned face highlights the intense gaze, and the blue of his eyes. A performance artist, Benson references identity, masculinity, colonialism and, with Ned Kelly, archetypes and visibility. Other works which impressed me were Adam Cullen’s paintings, executed mainly in bold, primary colours, with drips and vigorous, confident, brushstrokes. Ned Kelly with Horse 2011, portrays another iconic motif in Kelly artworks, the spectral horse. It is reminiscent of Albert Tucker’s Metamorphosis of Ned Kelly 1956, also on display. Both paintings are revealing portraits of mortality, fear, anxiety, and desolation. Like his hero Ned Kelly, Cullen also had strained relations with the law. Cullen won the Archibald Prize in 2000, with his portrait of David Wenham. Cullen died in 2012 at the age of forty-seven. 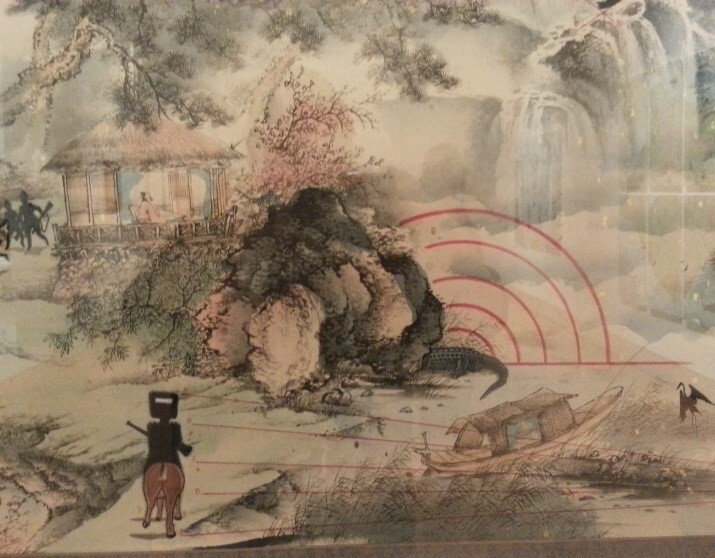 New cultural interpretations of the legend include, Mars Drum’s Ned & Burka on the Pink Lake 2015, and Chinese-born Australian artist, Guan Wei’s, Ned Kelly encounters the troopers in the Mystic Mountains 2003, a beautifully executed in a traditional Chinese painting style, in inks, on rice paper. The Jerilderie Letter, believed to have been dictated by Ned to Joe Byrne, is considered to be a political manifesto, which some view as Kelly’s call for a republic and an end to the British yoke. They are the words of a man who wanted his beliefs preserved in a form that would convey the truth as he saw it. The exhibition is worth more than one visit and runs until June 25, 2015. This exhibition has now finished. A link is provided to the Bendigo Art Gallery. Fig 2: Benson L, Ned Kelly Redgum: Hypercolour (detail) 2014, C type photograph, edition 5. 50 x 50 cm. Photo collection of the author. Fig 3: Guan Wei, Ned Kelly encounters the troops in the Mystic Mountains, 2003, inks on rice paper, 70.5 x 173 cm, collection of Dr Garry Helprin. Photo collection of the author. Copyright © 2015 Janet Bayliss. All rights reserved. No content, including images and text, may be used without written permission. Please support artists by purchasing original artworks.